A chef taps his inner triathlete. I grew up in Mexico, and my older brothers were always competing in triathlons — so I felt like maybe I should try doing one too. At age 15, I ran my first triathlon — a kids’ triathlon — and I won. So I ran five more between then and age 18. It just came so naturally to me. It wasn’t really that hard. By the time I was 16, I was training with guys that were 23, doing the same amount of mileage with them, at the same pace. I felt great. Then I started working in kitchens, and everything changed. I was focusing so much on my career, so all my time was dedicated to cooking. I gained a lot of weight, and I didn’t feel great. After a few years, I decided that I needed to get back in shape. I wanted to run, bike, and swim again! I signed up for the New York City triathlon and was accepted. This time, however, I wasn’t 15 years old with zero body fat. I was much older, and 50 pounds heavier. You’ve caught me right in the middle of my training, and I will be the first admit, it is so much harder now. I have to be more careful about what I am doing and how I am training. I’ve had to totally change my diet. Within two months of starting training, I lost 15 pounds. But I’m excited by that progress — it keeps me going. It makes me want to train every day. I just ran a half marathon in Miami in January, and now I’m in the final, crucial phases of my training, as the triathlon is next month. These days, I wake up at 5 a.m. I am in the pool by 6 a.m to swim several thousand meters, then I’ll run between four and six miles in the park, and I’ll finish by biking, either outside or on my bike at home. Sometimes I’ll do it all again when I come back from work. [It] might seem crazy, but my brother always told me when you train, you should always train with a smile on your face. If you are positive, you will enjoy training more, and you will perform better. He’s right. Running, biking, swimming — that is my escape. I’m not training because I have to. I’m training because I want to. Triathlons, more than just doing running, swimming, or biking as individual activities, provide you with so much adrenaline. The feeling when you are waiting to jump in the lake, or when you’re ready to run, the vibes of constantly switching gears — it’s so exciting. The transitions are what make it hard. Going from jumping off a bike to running — that is by far the most difficult. Your legs are used to peddling, so your muscles are super tight. You have to get used to that. But the challenge is what makes it great. I am confident, but incredibly nervous going into the New York City triathlon. Thankfully, since being a chef is already so competitive, I am naturally accustomed to wanting to compete. It is in my blood already. I hope I can call you after the race and tell you that I feel just like I did when I won that race at 15 years old. You just feel like you have accomplished so much in one day after you have been training for so many months. You put your mind to something so challenging, and then you achieve it, and it is absolutely incredible. That feeling is what I live for. Julian Medina is Chef/Owner of Toloache Bistro, Toloache Taqueria, Toloache Thompson, Tacuba Astoria, Tacuba HK, Yerba Buena and Coppelia. In this column, we highlight the other loves of industry folks, in order to glimpse who they are when they're off the clock. This week, the great outdoors. The things the industry loves in the off-hours. 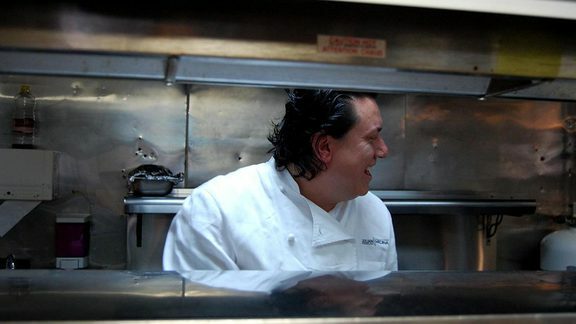 How boxing reshaped one chef's life. Chef Quinn Hatfield on scaling mountains and building yourself up.